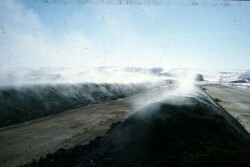 Put trillions of micro-organisms to work in your compost operation. Compost-One™ puts a proprietary blend of all natural and safe compost accelerators to work in your compost operation. The micro-organisms blended into Compost-One™ help energize compost production speeding up the maturation time as well as reducing costly windrow turns. Compost-One™ also helps produce a higher quality fertilizer by breaking down complex nitrogen sources such as urea, reducing the environmental impact of dealing with waste components. Compost-One™ is the solution of choice for maximizing the composting process. Works great on thermophilic compost. 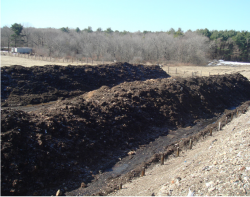 Increases the natural microbial activity of the compost pile. 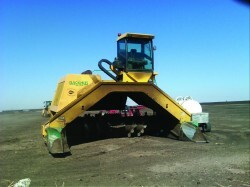 Reduces the amount of costly windrow turns. Makes a higher quality compost by making nutrients more available to the crop. Lessens the environment impact by breaking down complex organic nitrogen. Turn your manure waste liability into a profit machine. It all starts with the natural microorganisms that help break down compost nutrients. Compost-One™ is a complex blend of living microbials specially formulated for composting operations and is being successfully used in the field today. Making good quality compost takes time and effort. 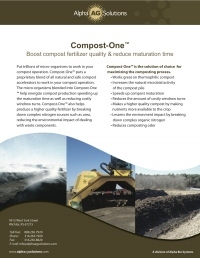 Compost-One™ maximizes the investment by reducing the time needed to bring compost to maturation. Compost-One™, designed with a robust blend of microbes, also helps more complete break down of nitrogen, phosphorus, and potassium, and ammonia. The more complete breakdown of these complex nutrients will result in the nutrients becoming more available. Click here to discuss your needs with an AAS representative or request literature.